Think of a 15-letter word that is spelled without using any of the letters T, A, X, E or S. And it means how Stephen King writes. The answer is BLOODCURDLINGLY, which is also the answer to the cryptic clue I wrote for the subject line. 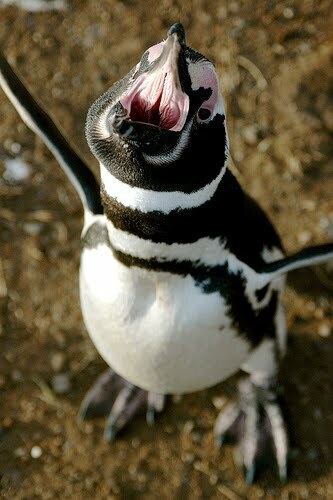 And just to cheer everyone up, here's a screaming penguin, compliments of Flickmor's photostream. Hey, I got my prize in the mail! A Townsend puzzle book -- too cool ! ! ! You all are too kind. I'd like to thank the members of the Academy blah blah blah. I sent in BLOODCURDLINGLY as well, but didn't get the call. Alas. I hinted in my last post that I was "a positive type" of person, or something like that. Cause I am. Type A+. NPR Puzzle 4/25/10 -- Here Birdie, Birdie . . .
NYT Monday 4/19/10 - A Capital Notion? NPR Puzzle 4/11/10 -- Mac & Cheese; What's Yours? NYT Saturday 4/10/10 - That's more like it! NYT Wednesday 4/7/10 - Was It A Rat I Saw?